Deployment starts with placing Drop Ships in such a way that they will act as a tank for the Beta Minions, on approach to one or more of the major defense structures - AirBombs, Roaster, and/or Giant Cannon.Beta Minions go down right away, just behind the Drop Ships, so they can fire PAST the Drop Ships while hiding behind them. This is important - Drop Ships have a tendency to get hung up on high HP structures like storages.Even worse - if they land over a Crusher, they’ll just stay there until something shoots them down (they drop the Larrys but the Crusher blows them all at one time). Day one has been BUSY! I stayed up late last night - until about 3a or 4a - just trophy pushing and running one attack after another. After getting myself together this morning, I sat down and worked on all of the BH6 games then started hitting my BH7 game for MORE attacks. I started BH7 off just below 4000 trophies, kicked it up to 4500 (ranked 115 in the US! ), then settled back down around 4300. Today I made it up around 4500 again and right now I am at 4424. My BH6 games are already taking hits as they come up against much tougher BH6 players - my highest is at 4001 with the others running 3100-3500. Omigosh, omigosh, OMIGOSH!It’s here, it’s here, it’s here! Builder’s Hall 7 upgrade is finally live and, of course, I went upgrade crazy on day one. 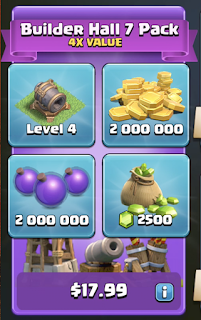 I had about 800K in gold saved up, so I ended up spending about 1300 gems to fill my Gold Storages for the upgrade (1.8M gold) then I gemmed the timer (another 1300 or so gems).At that point, this little beauty popped up…. 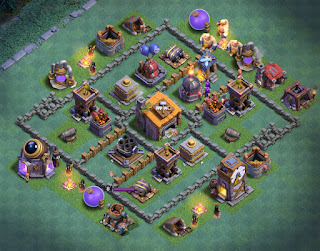 Builder's Base Attack Strategy - "Mass Beta Minion"
Mass Beta Minions (MBM) is a very simple strategy - you just drop 4 camps of Beta Minions on the base and let them do their thing. Air defenses typically can't stop them from pulling out a solid one star and at least a low percentage two star win. In fact, at BH4 and early BH5, you can drop them all in one place, exit the game, restart the game, and will often have 60% or better destruction when you come back. (The AI takes over and runs the attack; saves time if you use the Clock Tower to get through your attacks more quickly.) Of course, those with a level 5 Battle Machine (or higher) would never do this for obvious reasons. There are a lot of different sides to this story. First and foremost, as you get higher in the trophy rankings, you'll be more likely to face other players who are more advanced than you. SuperCell has told us that matches are based on trophy levels; the stronger the game, the higher it will likely be in the trophy rankings. That just makes good sense. However...rushing is the name of the game when it comes to the Builder's Base and higher level players are represented throughout the rankings! This is a problem for many reasons, not the least of which is the fact that a lower BH level may not be able to compete. 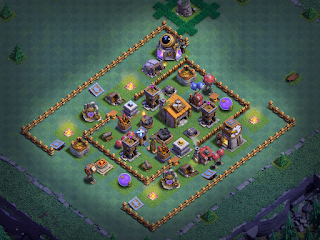 There are a lot of base designs out there for the Builder’s Hall.Some are great, some are…well…not so great.No base can defend against ALL attacks and many base designers will offer up clickbait claims like, “Anti-1-Star!” or “Best BHx Ever!! !”, which are usually pretty easy to spot. What if you just want to know how to build your own so you can tinker? Young padawan, to the right place, you have come!Much knowledge, have I, to share! We’ve talked a bit about Mitch before – the Beta Minions / Night Witch army composition.There are a number of variations of this attack strategy out there using 1, 2, or 3 camps of each.I had a couple more replays of two star wins I thought I’d share. A lot of players look at the Night Witch as a “spray and pray” troop, but in the hands of someone who is practiced with the troop, they can be devastating.This is especially the case when you’re fighting a box base with certain, key defenses accessible near the outer fringe of a base design.